BARCELONA–Pau! Ker-baka! There goes that Derrick Rose/Gasol matchup for what was supposed to be a classic in the presumptive final Sunday of the FIBA Basketball World Cup. The NFL can go back to scheduling this Sunday’s games. And now it’s Lithuania Thursday and if the USA wins that semifinal game on to Madrid Sunday for the winner of France and Serbia. That should make the USA a virtual lock for the championship and an automatic spot in the 2016 Olympics. Of course, they were saying that here about powerful Spain with Pau Gasol, Marc Gasol, Serge Ibaka and a half dozen other current and former NBA players. Pau Gasol, who can now officially begin training for the 2014-15 Bulls season, did his part with a game high 17 points, eight rebounds and three blocks to finish the tournament averaging 20 points and in the top four in points and blocks. But Pau was unable to do it alone as brother Marc was one of seven for three points, Serge Ibaka one of seven for two points and Ricky Rubio one of seven for four points. Marc Gasol and Ibaka combined for six rebounds as the team the USA feared for its interior size, and thus loaded up with big men like Andre Drummond, DeMarcus Cousins and Mason Plumlee, was outrebounded 50-28. “We had our worst game of the tournament, by far,” Pau Gasol told reporters afterward, identifying “intensity and focus” as the issues. Boris Diaw led France with 15 points and Rudy Gobert of the Utah Jazz 13 rebounds and half as many offensive rebounds as the entire Spain team. Noah had arthroscopic surgery after the season and didn’t play for France. Tony Parker also didn’t play due to another long Spurs playoff run, thus making France an unlikely contender. Serbia, another lower seeded team and now France’s opponent, got to the semifinals with an upset as well, over Brazil. But the France subjugation of Spain was as shocking as when Napoleon turned on his former Spanish allies and defeated them in the Peninsular War and Barcelona fell in 1808. Though the sadness was great as well here Wednesday night, and for FIBA as well. They were expecting a raucous turnout for Sunday’s expected game in Madrid with the USA, which now becomes the Franco-American battle. The last big one when John Adams was president pretty much ended in a tie with Spain mostly rooting for the French. This time it’s Sangria and Tapas to drown their disappointment. Hey, that’s not so bad! So for the USA team which has had surprising problems with Lithuanian teams in international competitions the last decade, it becomes now less an issue of being an underdog. Instead, it’s guarding against overconfidence. It is disappointing from a basketball standpoint because the world always wants to see someone stand up to the great NBA players for USA Basketball. Perhaps someone still will, though coach Mike Krzyzewski says his team continues to improve. 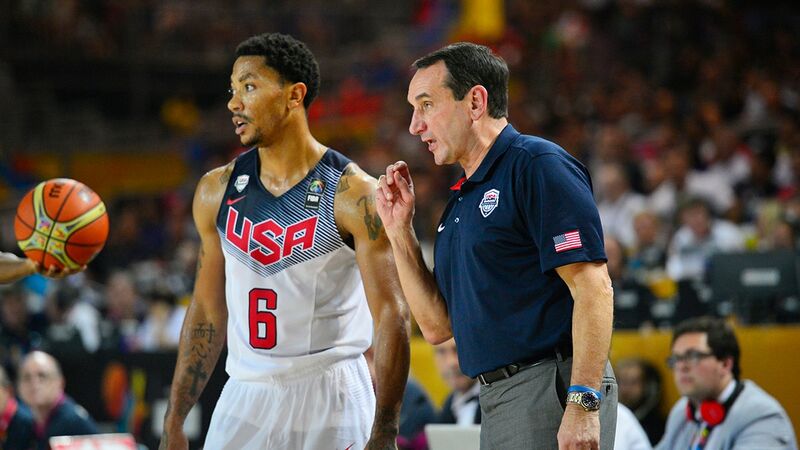 “I think we’ve played well,” Krzyzewski said earlier in the day before the Spain loss. “I don’t know what everybody’s been watching. But our guys have played their butts off. They have great camaraderie. We’ve developed into a close group. If we don’t win, it won’t because we haven’t put the effort in and developed the camaraderie. We’re proving worthy of winning. Whether we do or not. And it looks a lot closer to that pot of gold medals, if not Derrick and Pau facing off. The next time we see them it will be in the same uniform, finally.